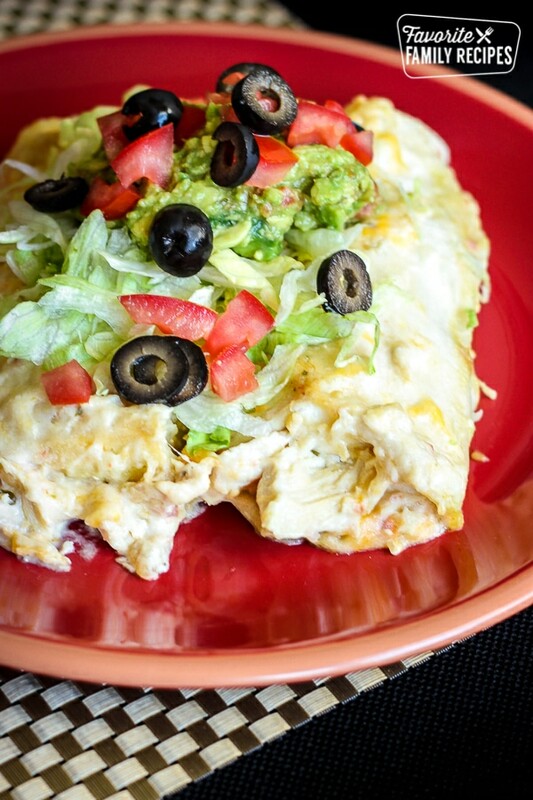 These delicious Chicken Enchiladas are a staple at our house. We have them for dinner at least once a month. It is also one of my favorite go-to recipes when company is coming over. I serve these chicken enchiladas with our Mexican Rice, our Restaurant Style Refried Beans, and our Best Guacamole Ever. Everyone LOVES this meal! It is better than eating out and much less expensive. These Chicken Enchiladas are really easy to throw together when the chicken is prepared ahead of time. My favorite method for preparing shredded chicken is in the slow cooker. Place the chicken breasts in the slow cooker, cover with water and some salt and whatever seasonings you like (if I’m preparing chicken for enchiladas or tacos I like to add some hot sauce or salsa). Slow cook on high for 3 – 3 1/2 hours or on low for 6 – 7 hours. The chicken comes out tender every time and is easy to shred with two forks. If you are short on time, the chicken can also be cooked on the stove top. Place chicken breasts in a saucepan, cover with water and a dash of salt, bring to a boil and then cover and simmer for 12-15 minutes or until chicken is no longer pink in the middle. Either method for cooking the chicken works great in this recipe. Make sure you save the chicken broth to make our Condensed Cream of Chicken Soup to use for the sauce in this recipe. This recipe makes 8 enchiladas. Spread 2/3 cup of green enchilada sauce evenly on the bottom of the dish. In a large bowl, combine the shredded chicken, 1 cup of cheese, remaining enchilada sauce, condensed cream of chicken soup, sour cream, and salsa. Fill the 8 tortillas with the chicken filling, leaving about 1 cup of the filling to spread on top. Fold the ends of the tortilla in and roll up the enchilada. Place the enchiladas in the 9x13 pan (I usually have a row of 6 going lengthwise with 2 additional enchiladas on the side). Spread the remaining 1 cup filling on top of the enchiladas. Remove enchiladas from the oven and sprinkle the top with remaining 1 cup of cheese. Bake for an additional 5-10 minutes or until cheese is melted. Serve enchiladas with your favorite toppings. Made this last night. VERY good!!! My 2 year old son even had seconds! What size tortillas does this call for? Which brand of green enchilada sauce do you use/prefer? My family loves chicken enchiladas but I have never tried the addition of cream of chicken soup before. Can’t wait to try this ! It really doesn’t matter. We usually use Herdez but you can really use whatever 🙂 Hope this helps!